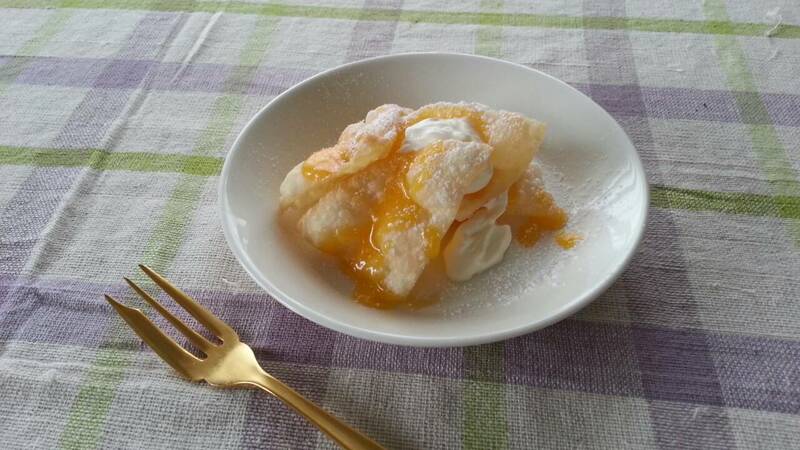 You can make an easy lemon pie by using Gyōza wrappers that is usually used for making Gyōza . ① In a frying pan, heat the cooking oil to about 170℃. While the oil is heating, cut the gyōza wrappers into 4 equal pieces. When the oil is up to temperature, fry the gyōza wrapper pieces until lightly browned, then remove them and let the excess oil drain off. ② Mix the egg well. Use a strainer to ensure even consistency. Add the butter, sugar, and lemon juice to a bowl, place the bowl in a bath of hot water (water that has been brought to a boil before turning the heat off), and mix the contents until everything is dissolved. Remove the bowl from the bath and mix in the egg. Return the bowl to the hot water bath, and use a rubber spatula to stir the contents for about 10 minutes, or until the contents thicken. Remove the bowl from the bath and let it cool. ④ On dessert dishes, build individual pies with alternating layers of gyōza wrapper quarters, whipped cream, and lemon curd. These do not have to be stacked neatly. Finish with a dusting of powdered sugar.